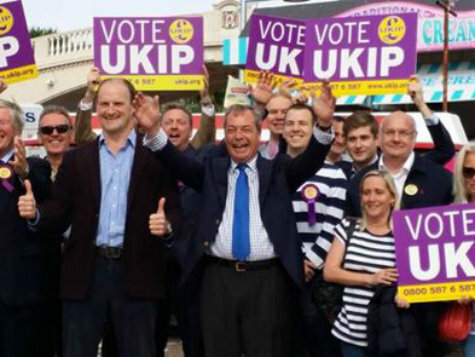 CLACTON-UPON-SEA, United Kingdom — The United Kingdom Independence Party (UKIP) tonight took its first elected seat in the House of Commons following Douglas Carswell’s stunning defection and by-election in the Essex seat of Clacton-Upon-Sea. Shortly after the Heywood and Middleton by election result – a vote hosted on the same day in the north of England – UKIP cruised to victory with a total of 60 percent against the Conservative Party’s 25 percent. For Prime Minister David Cameron and his party the result is a hammer blow, though not an unexpected one. On today, the PM’s birthday, the Tories got clobbered in Heywood and mauled in Clacton. Rumours of fresh new defections have abounded tonight, though UKIP leader Nigel Farage and Clacton victor Douglas Carswell put a humble face on their win. Mr Farage was grateful to UKIP activists and voters, telling Breitbart London: “Douglas Carswell’s courage and bravery has been rewarded by the electors of Clacton, and I’m absolutely delighted. The total swing in Clacton is one of largest ever in British politics, and truly the result reflects the UKIP tanks parked on the British political establishment’s lawn. The fact that UKIP have gone from nowhere to second in Heywood, and from nowhere to first in Clacton is a sure sign that the party is now part of UK electoral furniture. What the future holds from here is anyone’s guess, but you can bet the Prime Minister will have some choice words for Tory voters tomorrow.